Planting under or near powerlines can be challenging. Here are some suggestions of some good plants for this location. 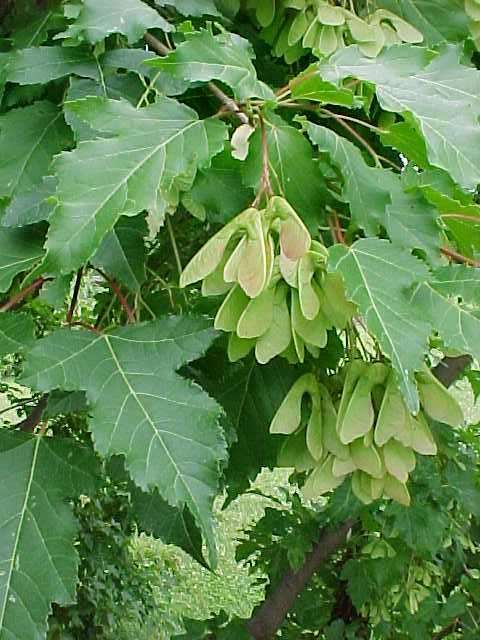 Dr. Carl Whitcomb comments that Amur maple is “an excellent small tree because of its form, foliage, and fall color.” Michael Dirr says “This species ranks as one of the most cold-hardy maples, and certainly one of the most adaptable.” One photo of this tree on the PlantFinder page [showing its “multiple-trunk” form and green summer foliage] shows this terrific tree growing on the grounds of the Oklahoma National Memorial. 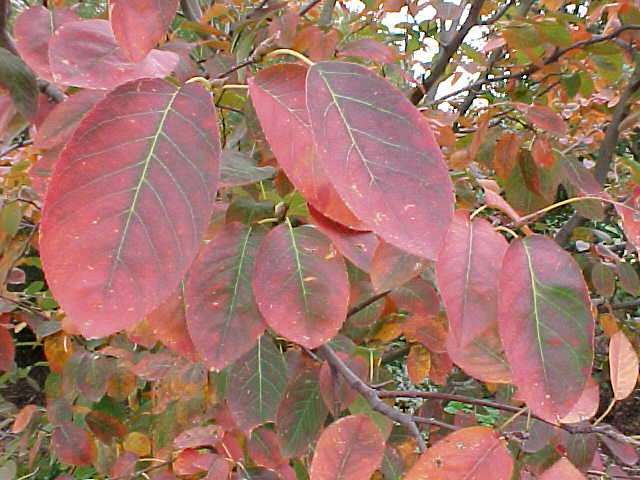 Its summer form, its red samaras [seed capsules], and terrific fall color makes this a highly attractive tree that is… at the same time… easy to grow. Its mature height will never interfere with power lines… or cause the arrival of the dread power line tree police. This small tree has great character & appeal in any garden… and will distract your attention in all seasons from the presence of power lines. Michael Dirr notes “The newly emerging leaves are purplish… the best of the [cultivars] include ‘Autumn Brilliance’…” Dr. Whitcomb calls it “A showy small tree with attractive form, foliage, and bark… with good fall color.” On all counts, this is a very attractive small tree with multiple seasons of interest. The better the soil, the better its performance. Please do not plant this tree directly under power lines. Plant this tree 6-10 feet out from under the lines… and avoid future pruning challenges. This is, quite simply, a beautiful and attention-getting small tree. All redbuds possess this quality in the spring when loaded with flower buds. 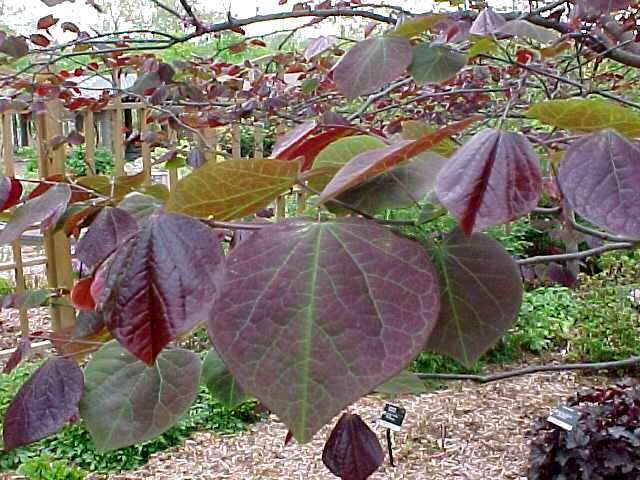 Forest Pansy is a Redbud that goes one step further… its red-purple foliage makes it a stand-out plant throughout the growing season. Please do not plant this tree directly under power lines. Plant this tree 6-10 feet out from under the lines… and avoid future pruning challenges. Also please note two qualifying statements: [Whitcomb] “Forest Pansy is less drought tolerant than most redbuds and does best in a somewhat protected location.” [Dirr] “In highly stressed situations, redbuds may decline from diseases…” In other words, redbuds are not “plant it & forget it” trees. 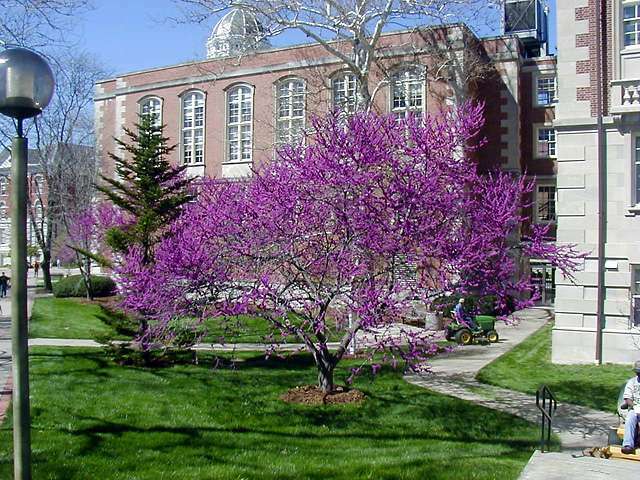 Dr. Whitcomb notes the significant differences between ‘Oklahoma’ and the species Eastern Redbud: “Oklahoma has deep purple flowers, and very lustrous shining leaves. Less susceptible to leaf rollers, probably due to the leaf structure and surface texture.” My experience is that the waxy cuticle covering the leaf also helps prevent leaf spot disease… a common occurrence on eastern redbud. The rich, deep flower bud color literally makes eastern redbud look pale by comparison. Remember redbuds need supplemental watering during periods of high heat and respond well to some summer wind protection. Dr. Whitcomb says it well: “An interesting geographical misfit. Grows well and functions admirably as a landscape [plant] in the Prairie states…” Dirr adds: “Pendula is an attractive weeping form with graceful, elegantly arranged pendulous branches. 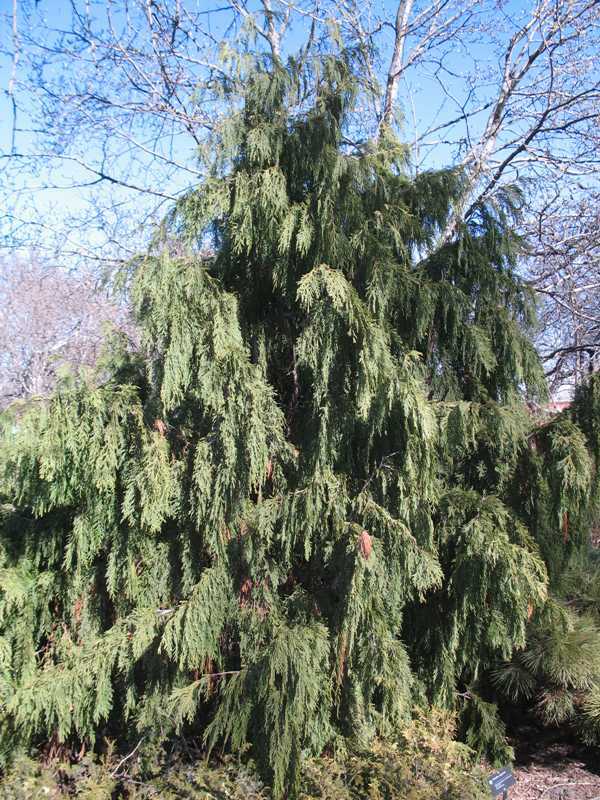 It is reasonably common in the Middle Atlantic states.” This is one of the conifers that looks good as a juvenile… it is cute at that stage and breathtaking later on. Please do not plant this tree directly under power lines. Plant this tree 6-10 feet out from under the lines… and avoid future pruning challenges. Michael Dirr calls this tree “A most elegant dogwood…” Dr. Whitcomb adds: “A very attractive tree when in flower and during fall and winter, when the form adds interest…” Chinese Dogwood is the Rolls Royce of dogwoods… spring blooms, tiers of horizontal branches, fall foliage, fruit, and winter silhouette offer four seasons of beauty. 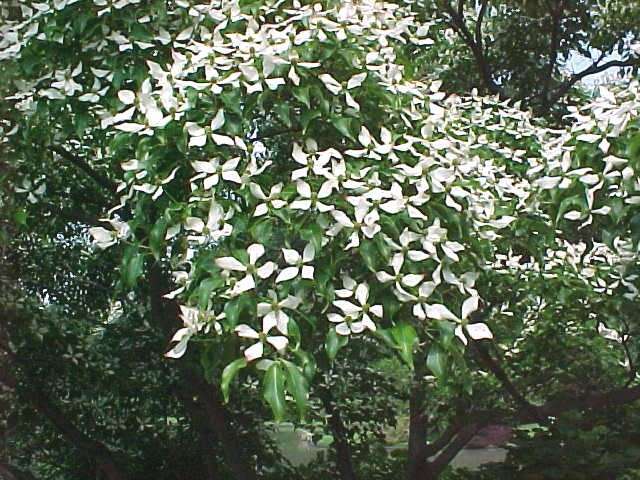 Chinese, or kousa, dogwood is highly resistant to dogwood anthracnose, a disease killing large numbers of Cornus florida, the flowering dogwood native to the U.S. Please do not plant this tree directly under power lines. Plant this tree 6-10 feet out from under the lines… and avoid future pruning challenges. Michael Dirr describes the Smoketree as “A choice native species that occurs in limestone soils.” and “The rich blue-green, oval leaves turn magnificent yellow, orange, red, and reddish purple in fall…” In Oklahoma City this hardy small tree regularly turns the best shades of pumpkin orange in fall. It literally jumps out of the landscape at you… and is strikingly beautiful. Dr. Whitcomb states this is “A very tough, durable plant. Grows in a wide range of soils: alkaline or acid, infertile, rocky or gravelly. Quite drought-resistant. Appears to be well adapted to… abused urban soils.” Please do not plant this tree directly under power lines. Plant this tree 6-10 feet out from under the lines… and avoid future pruning challenges. 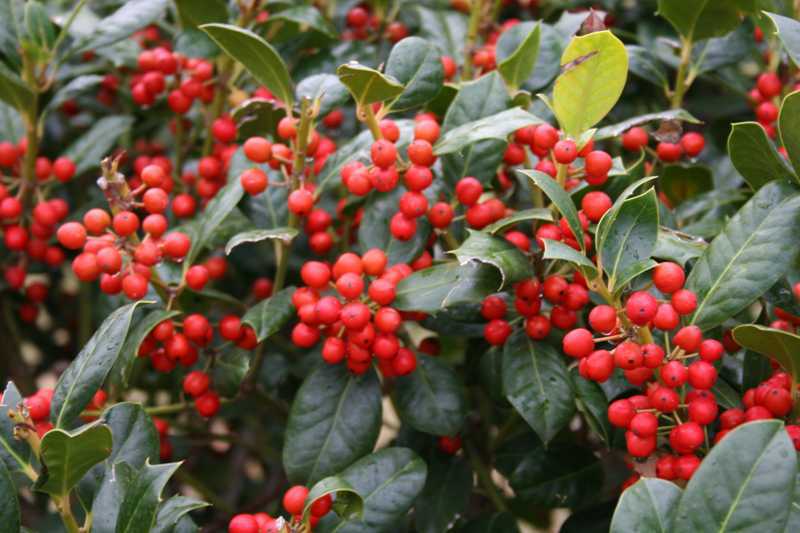 Dr. Carl Whitcomb calls this “An amazingly durable and tolerant holly that thrives under a wide range of conditions. Especially drought-resistant and a prolific producer of bright red berries.” This is not faint praise. Nellie Stevens Holly is almost the only broadleaf evergreen that glides through our harshest winters with little or no damage. I will qualify this by saying it is wise to water any broadleaf evergreen thoroughly through the winter months… at about 12-14 day intervals. Beyond that Nellie Stevens is an almost carefree, and very beautiful, plant. 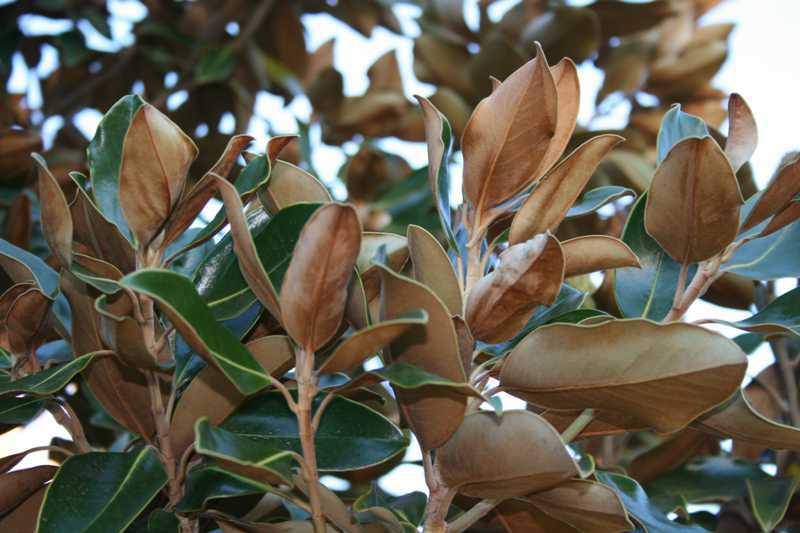 All the planting and maintenance rules that apply to the grand old Southern Magnolia also apply to this diminutive relative. Given that care, this is a magnificent broadleaf evergreen. Dr. Whitcomb summarizes its assets: “…leaves smaller than the species and remains more compact with dense foliage, at least until quite old. Prolific bloomer all season.” Please note that last comment…. This is the only cultivar of Southern Magnolia that blooms all summer long. If this small tree is hardy in your area…. you have the potential for growing what is truly a little gem of a tree. 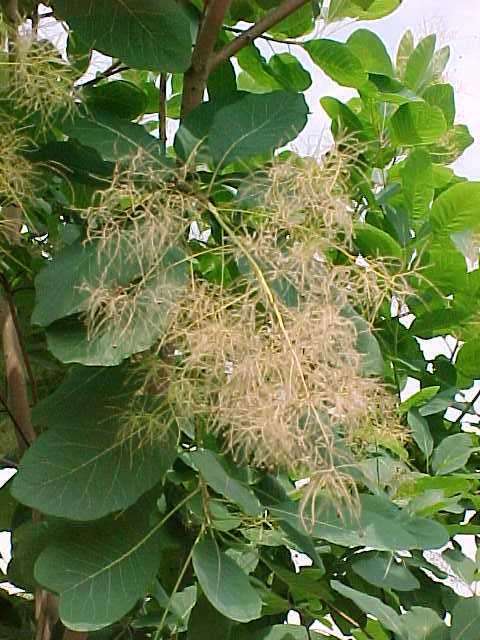 The PlantFinder page for this small tree points out [several times] that bloom may only be abundant in alternate years. While not disputing this comment, I will offer that every Sargent Crabapple I have planted in the past 35 years has bloomed admirably each spring. Its wider-than-tall form gives it a distinctly oriental, or windswept, appearance that is very attractive. The pink buds open to pure white blooms at slightly different times… so pink buds and white blooms coexist in happy profusion. 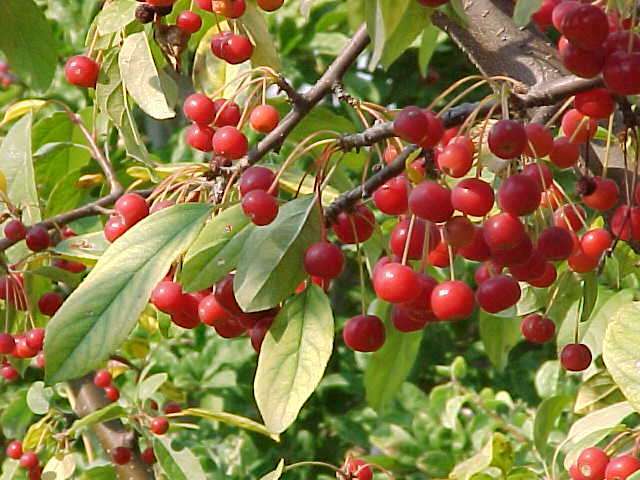 The small fruit are brilliant red in color and are “persistent”… they do not fall and clutter the lawn. I recommend this tree highly.